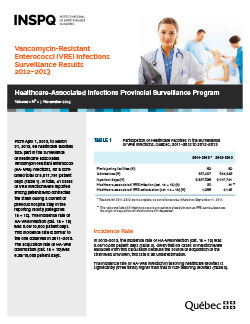 From April 1, 2012, to March 31, 2013, 89 healthcare facilities took part in the surveillance of healthcare-associated vancomycin-resistant enterococci (HA-VRE) infections, for a combined total of 5,017,791 patient days. In total, 41 cases of VRE infection were reported among patients who contracted the strain during a current or previous hospital stay in the reporting facility (categories 1a + 1b). The incidence rate of HA-VRE infection (cat. 1a + 1b) was 0.08/10,000 patient days. This incidence rate is similar to the one observed in 2011–2012. The acquisition rate of HA-VRE colonization (cat. 1a + 1b) was 8.26/10,000 patient days.